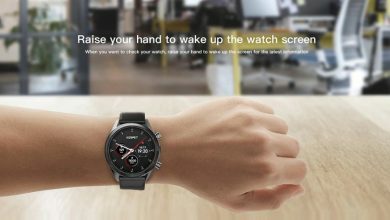 Zhiyun WeeBill Lab is a new, long-awaited creation from a Chinese company, which initially seemed quite doubtful to everyone in terms of their design. 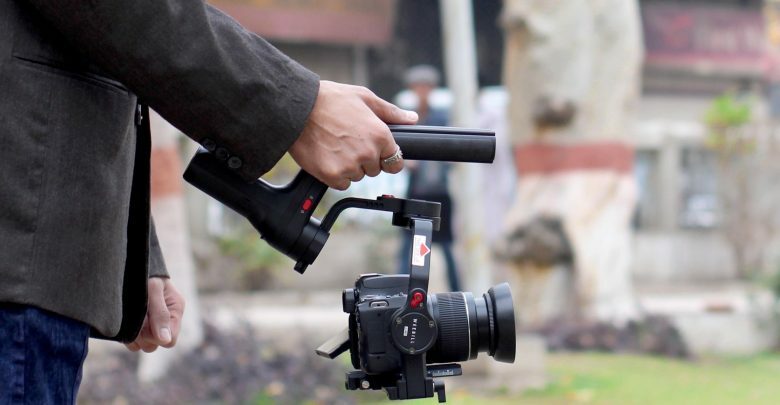 The Zhiyun WEEBILL LAB Handheld Stabilizer for Mirrorless Cameras supports cameras weighing up to 6.6 pounds. It features a removable handheld tripod which can be mounted on the battery bin as a grip providing additional functionality, as opposed to crowding all the controls on the primary handgrip. WEEBILL LAB may sound like a bit of a crazy name, but there is a story behind it. We spent some time with this stabilizer and were quite happy. Anyways, turns out that the Weebill is Australia’s smallest bird, a name that was chosen to emphasize the gimbal’s small dimensions and lightweight. 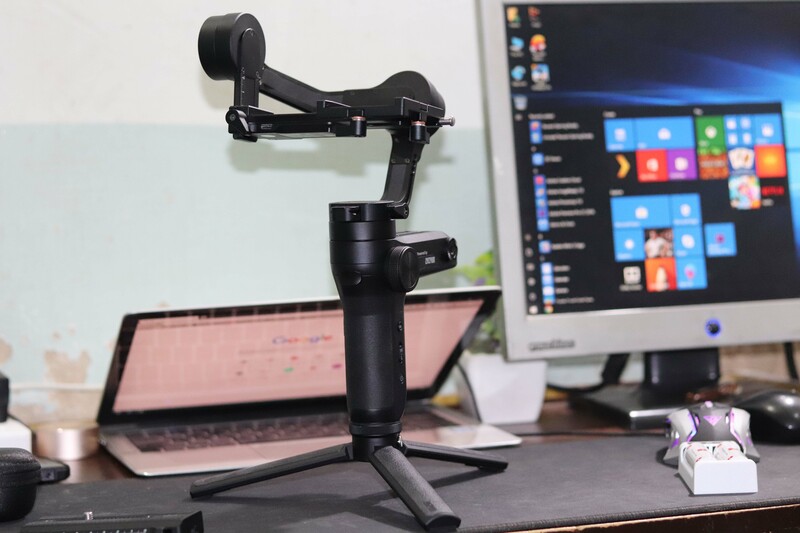 LAB, stands for Zhiyun’s premium line, hence the combination WEEBILL LAB. Read on for a full review. The gimbal features include Pan Follow, Full Follow, Locking Mode, PhoneGo Mode, Vortex Mode, and POV Mode. 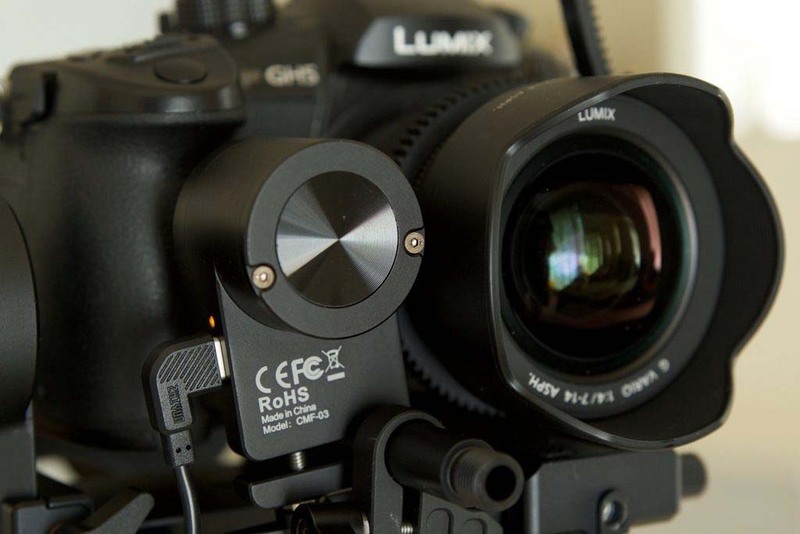 The included lens support is useful when working with a long lens, and an external follow focus motor (not included) to draw focus on a manual lens. 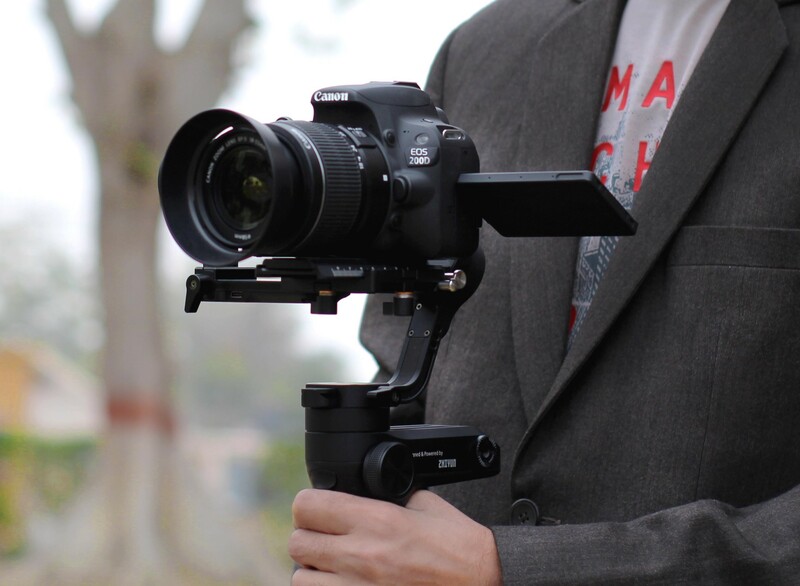 Downloadable applications allow you to adjust and control gimbals wirelessly. Including a removable tripod holding the gimbal upright while balancing to become an extension to the main handle. One thing that I liked here is the new case. Unlike the previous Crane 2 case, the Weebill case is a 100% foam case that felt more compact, while also providing better protection to the gimbal. 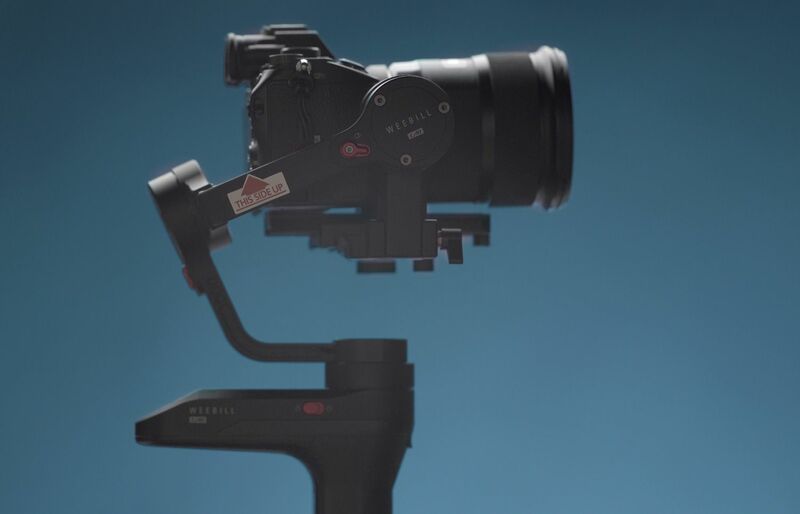 The design and form factor of this gimbal is arguably the most unique element. Most aspects of this gimbal have been really well thought out. The obvious feature of this gimbal is the fact that it’s relatively tiny. This is especially noticeable when you compare it to many other gimbals in the same market segment. The compact size and design mean that I’m able to comfortably pack the WEEBILL with a full frame camera, two lenses, and some minor accessories in a messenger bag. This is extremely useful if you’re a run a gun videographer and need to travel light. Even if you’re not traveling light, it just means you’re not necessarily lugging around your gimbal in a huge carry case. The WEEBILL LAB has some of the worst ergonomics of any gimbal I’ve ever used so far. The compact design plays a big part in this and although it is a feature it’s also a drawback. The handle is difficult to hold because of its shape and also the fact that the buttons get in the way. Trying to use this gimbal without the mini tripod is extremely difficult. The buttons and will get in the way and affect the footage. The joystick is another thing that I really don’t enjoy using and I try and avoid it in most situations. The joystick isn’t precise or smooth and I highly recommend against using it. The flat design means that trying to move the gimbal in any precise manner is very difficult or not at all possible. Although your thumb can rest on it relatively comfortably it slips a lot when trying to use it. The other issue is the control wheel; it reminds me of ones you’d expect on some really cheap entry level cameras. The control wheel is also not that precise and difficult to use too. Fortunately, when you attach the mini tripod to the gimbal many of these issues are minimized significantly. For this reason, I would recommend having the mini tripod attached to this gimbal at all times. Although this does increase the overall size and weight of the gimbal when in use, it is removable meaning that transporting the gimbal is still much easier than any other gimbal I’ve used. Overall the ergonomics are relatively bad but the included tripod fixes many of the issues making usability fairly pleasant. From a usability standpoint, this might be the easiest gimbal to set up and use. This is predominantly because the WEEBILL LAB has a number of lock mechanisms which hold individual sections of the gimbal in place. This is especially useful when you’re balancing the gimbal because it allows you to lock all movements except for the one you’re focusing on. For example, if you’re trying to balance the tilt you can lock everything in place so only the tilt section will actually move. The locks functions are also super useful for when transporting the gimbal in anything other than the original case. All movements can be locked, therefore there’s little risk of the gimbal moving and this prevents any potential damage to the gimbal or anything else you may be transporting. One of the best features of this gimbal and definitely my favorite is the fact that you can attach a mini tripod to two individual sections of the gimbal. This is without a doubt the most useful feature I have ever used in any gimbal. 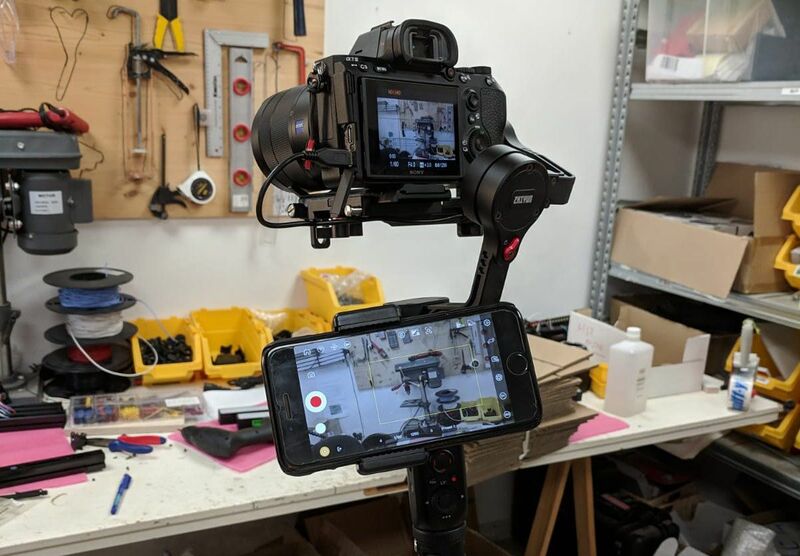 The benefit of this is the fact that you can comfortably and easily switch from having the gimbal upright to underslung. 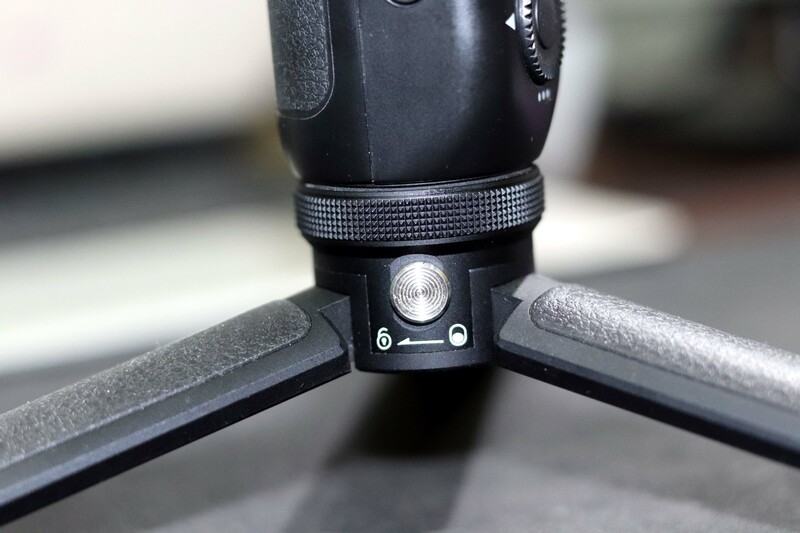 Zhiyun only provides one mini tripod which is reasonable, however, I recommend having a mini tripod attached to both sections at all times when in use. The reason for this is because having to switch where the tripod is mid-way through filming is a little bit of a pain. For this reason, having two tripods attached at all times means you can change from upright to underslung without needing to stop filming. The other benefit of using the mini tripod is that it drastically improves the ergonomics of the gimbal. 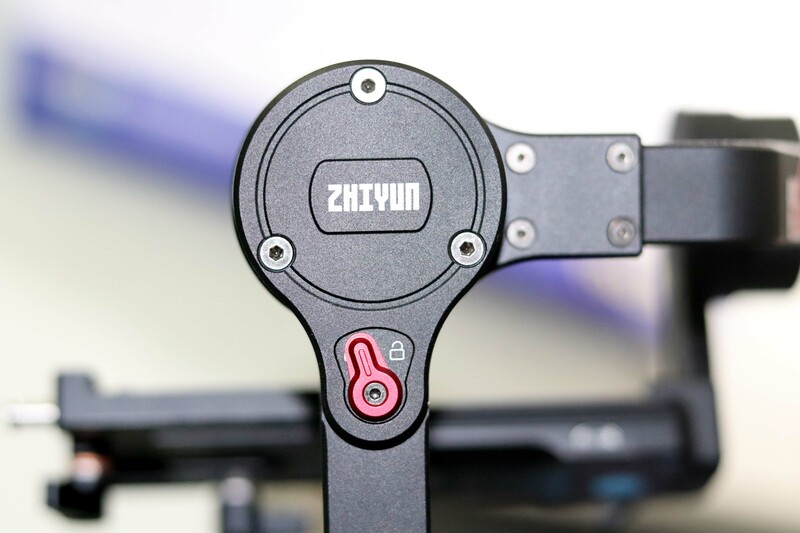 On the “back” of the gimbal – the side that is facing you – there are two big buttons, a joystick to control the gimbal movement, and a disc to navigate the menus. This area is also where they put the little OLED. I love how the buttons are separate and that you no longer need to remember sequences of buttons to change some settings. The OLED monitor could have better placement. 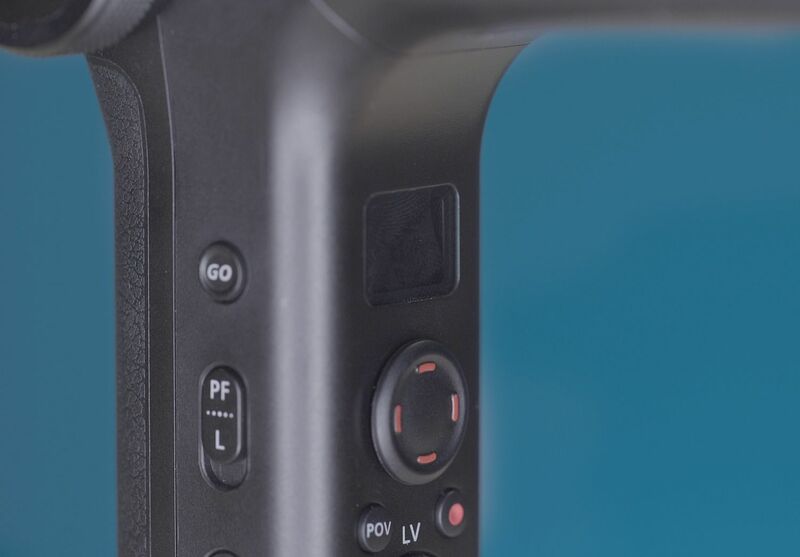 The little reverse L hides the OLED monitor on some positions, and I would love to see that OLED move to be above the top tripod port. This would make it visible in more use cases. A third control is placed where you would usually put a “trigger”. It changes the “follow mode” of the gimbal for the time the trigger is pressed. It took some getting used to vs. how it is done in the older Crane 2, but once I got used to it, it felt more intuitive than how it was done on the older gimbals via the menus. I think that if this is your first gimbal, it would feel very natural. 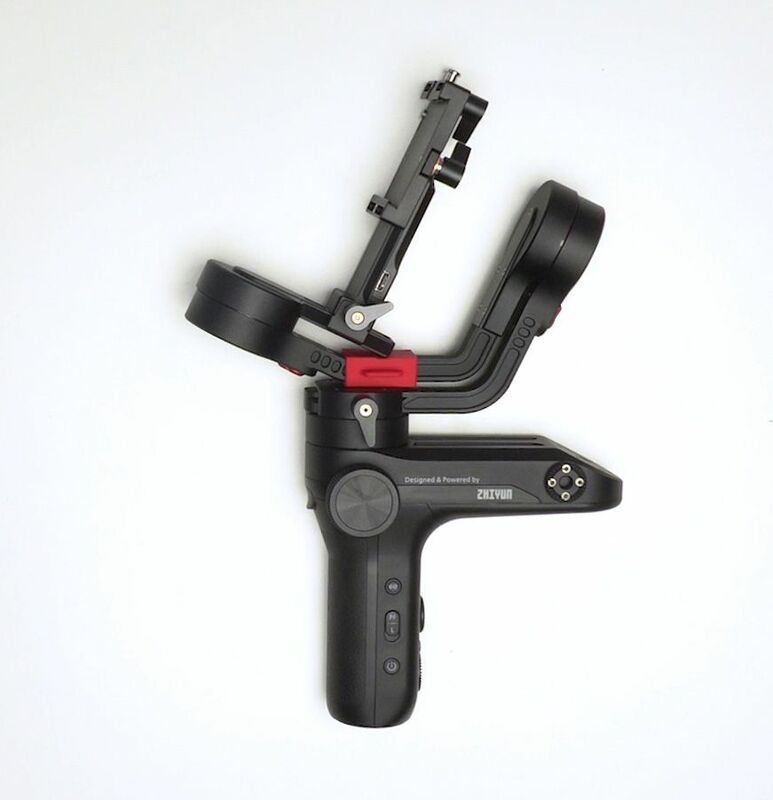 Double-Click on the trigger also resets the gimbal to the initial position. This was very easy once the gimbal got “confused” or just needed a quick reset. One thing worth noting on the trigger mechanism is that there is no way of locking the gimbal in follow mode. It’s all well if you’re only filming in pan-follow mode. But if you want to add pitch as well, you can’t do it in low-mode (no trigger access). For me, it’s a shortcoming, because it takes away the ability to shoot dolly moves with a tilt in underslung mode. The fourth and last control group is found on the left side of the handle. There is a small switch (thank god for the mechanical switch) to toggle between L and PV modes. And there is a small button to trigger the PhoneGo mode, which I would probably relabel as action mode where the gimbal simply follow your movements if you need to track something fast. There is another big wheel used for pulling focus if you have the follow focus module, we dd not get one and did not test this function. The Weebill provides two features that will significantly reduce your calibration time: Locking Axis and Double Quick Release Plates. Each axis can be individually locked which means that you can calibrate each axis separately while locking down the two other axes. I love this feature, and it does make calibrating easier. The other clever mechanism is the double quick release plate. Imagine a plate that is sliced into two thin plates. The top part always staus with the camera and the bottom-part stays with the gimbal. You calibrate the camera by attaching the two halves together and locking a small lever. 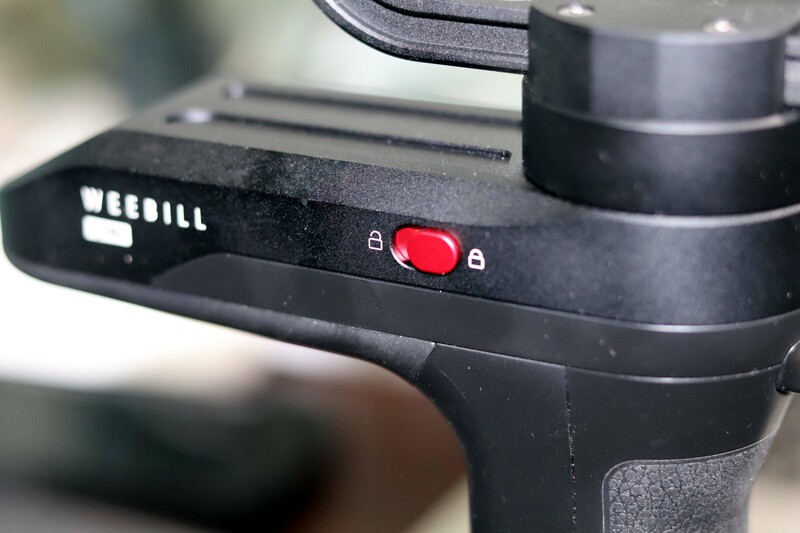 If you take your camera off the gimbal, the bottom part of the plate stays on which means that you don’t need to recalibrate when you lock the camera on the gimbal again. 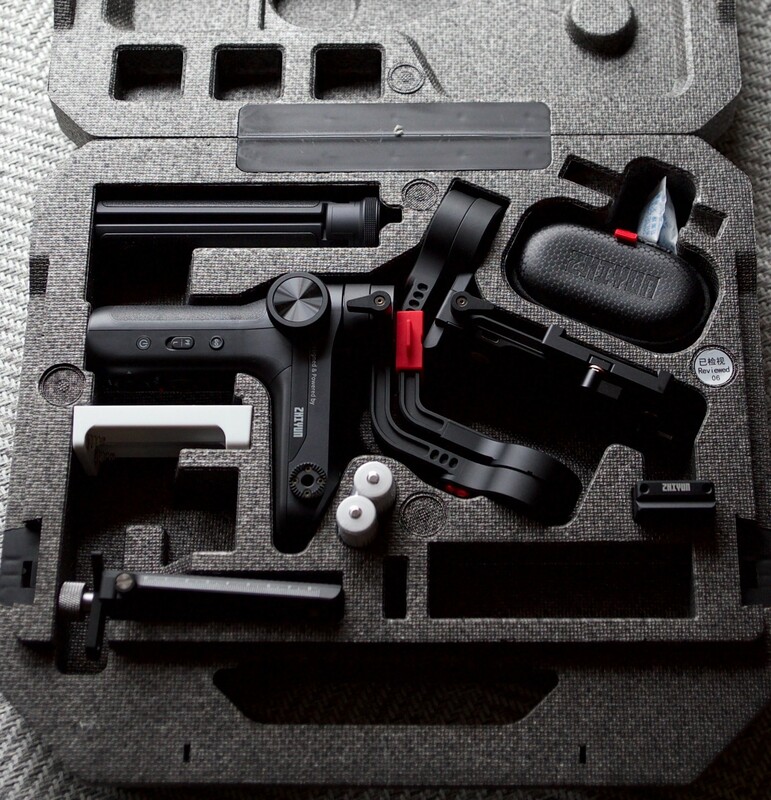 A nice side effect of the locking latches is that it’s now easier to carry the gimbal outside of its case. It stays locked and behaves nicely while being moved around. The motors on the Weebill LAB are strong but not as strong as its bigger “crane” brother. This is understandable with the weebill aimed at mirrorless cameras. We had to put the motors on “medium” settings. (with the Crane 2, we used the “low” setting for the same combo). On the other hand, we never needed to get to “high” settings. You will know that you need to adjust the motor strength settings because you will get a nasty vibration on some angles. The A7III (700 g) and the 35mm Samyang (720 g) weigh about 1.4 kilos, and they balanced well. With the 50mm canon art lens (815g) and an MC11 adapter (~400g) we were scratching two kilos and had to set the motors on high. While on the spec the gimbal supports three kilos, our 2 kilos put it on its highest setting. This could be relevant to how the weight is distributed. Maybe more compact three-kilos setups will work, but I would not recommend using the gimbal with non-native lenses. We did do a quick test with the Sony RX-100 and even with the included riser balancing was not trivial. I guess it’s just too small. The footage using the medium setting was just as smooth as we expected, even when running with the gimbal. 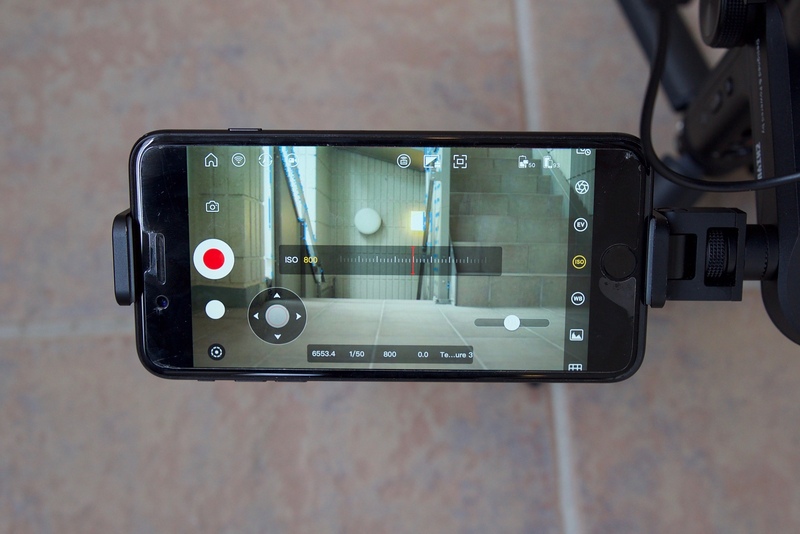 We used an iPhone 7 for controlling the gimbal. And magic happens. 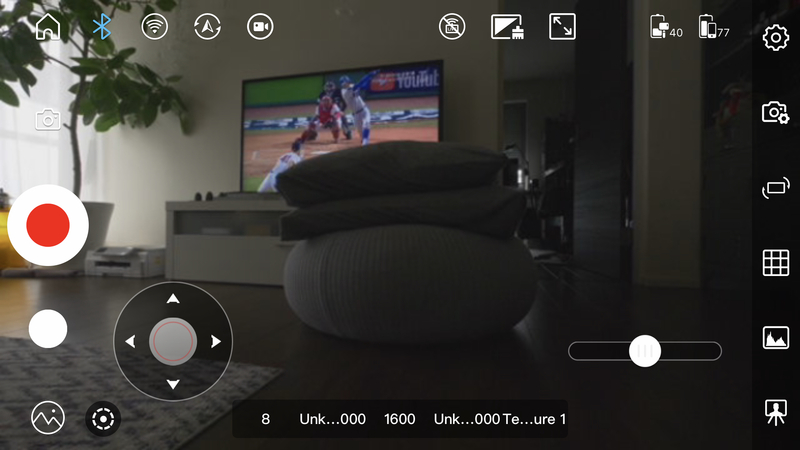 You can start and stop recording from the phone or the handle, see your framing, and control various settings. One feature that the team liked is the ability to see helper grids. The phone holder does not come with the Weelbill by default (why?) and you’d have to get it separately for $30. I did not get the phone holder, so I cobbled something together from a small ball head and a phone selfie adapter. The experience or using a phone as an external monitor is something I am familiar with and for small setups, it works quite well. Most modern phones can handle quite a bit of sunlight and they are always with you. You would want to go go to airplane mode and only open Bluetooth and wifi to avoid any incoming calls. There is a bit of a delay when using a smartphone tough, so it is not as smooth as using an external monitor. In the end, the choice to use a phone (cheap bright, always with you) or an external monitor (brighter, more to carry, no delay) is a personal and budgetary preference. This is something that we did not test ourselves, but we did look at the documentation. And it looks like the WEEBILL is compatible with most cameras that you would want to use it with. The list includes most Sonys: A9, A7III, A7RIII, A7RII, A7SII, A6500, A6300, A6000. I wish the older A7II was in that list as well. 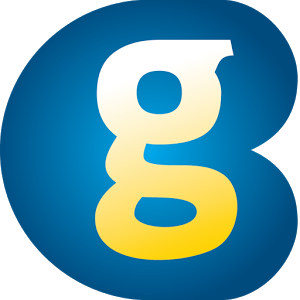 On the Panasonic front, it includes the GH5, GH5S. Each camera supports various lenses and you can see the full compatibility guide here (December 2018). The gimbal runs on two batteries which is easier to handle than three batteries. The included instruction was useless. If you are the type of person who RTFMs, head over to Zyhun’s site and get the full copy. In the version that we got, it was not possible to turn the gimbal on when it was in lown angle mode. The tripod has a locking mechanism to prevent it from turning while in the underslung position. If you are not careful it will lock in too tight and will be very (VERY) hard to unlock. I love the Weebill LAB for its form factor, smooth operation, phone compatibility, weight and price point. I would love to see some improvements to the OLED location and app stability, but those are not deal breakers for me. 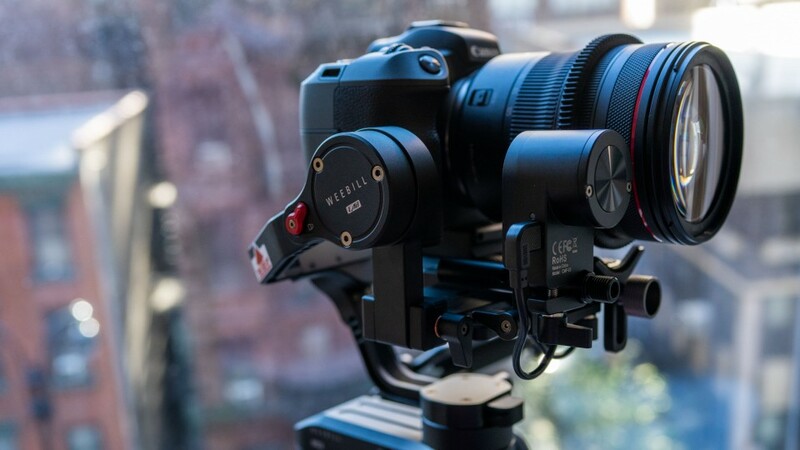 I think that for small mirrorless cameras the Weebill provide excellent value and I recommend it over the bigger gimbals for anyone using a mirrorless camera and native lenses. 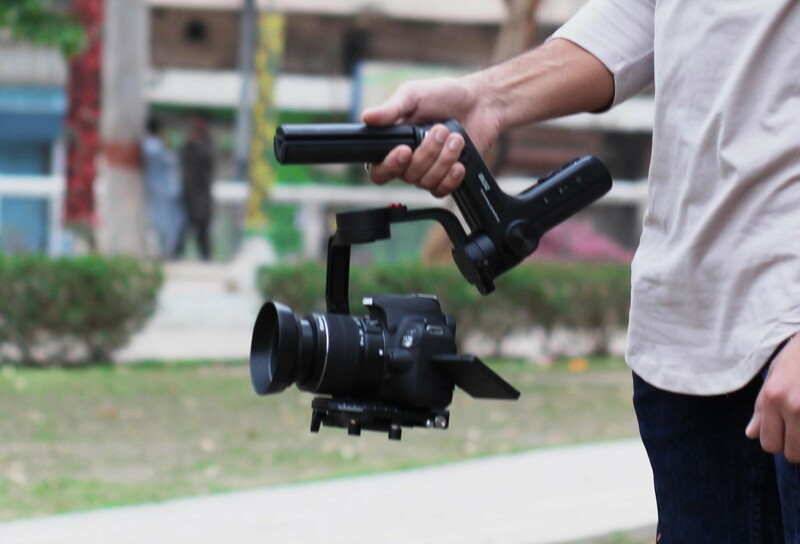 The number of gimbals that are available on the market can make it a little confusing when trying to decide which gimbal you should buy. Fortunately, companies like Zhiyun and several others are now categorizing gimbals for specific camera types. The WEEBILL LAB is predominantly designed for smaller, lighter camera systems. I prefer to shoot with a smaller lighter setup and the WEEBILL truly aides with that aim. The compact design is extremely useful. I absolutely love the fact that I’m now able to comfortably packs most of what I need including this gimbal into a messenger bag. This provides a level of freedom that was wasn’t afforded to me before. The most wonderful thing about the WEEBILL is that there are no compromises when it comes to the quality of footage it can produce. Although I’ve made recommendations in the past, This latest gimbal from Zhiyun has changed my mind. The WEEBILL LAB isn’t perfect, but, it’s still the best mirrorless gimbal that you can buy.